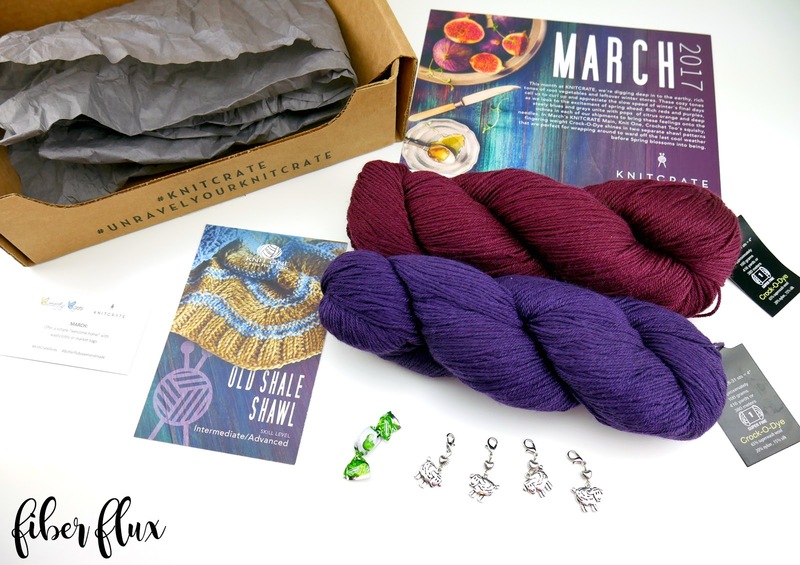 Fiber Flux: March KnitCrate...Unboxing, Giveaway and Review! March KnitCrate...Unboxing, Giveaway and Review! Hi there stitchers! I have something special for you today! I recently partnered up with the folks at KnitCrate, the perfect treat for any yarn lover. Check out my February KnitCrate review too! KnitCrate is a monthly subscription box that arrives right to your door. Each month it includes a fun pattern, enough luxury/premium yarn to make the pattern at least once, PLUS a fun bonus item too! This can be a fun tool, a sweet treat, or a soothing luxury item to pamper. 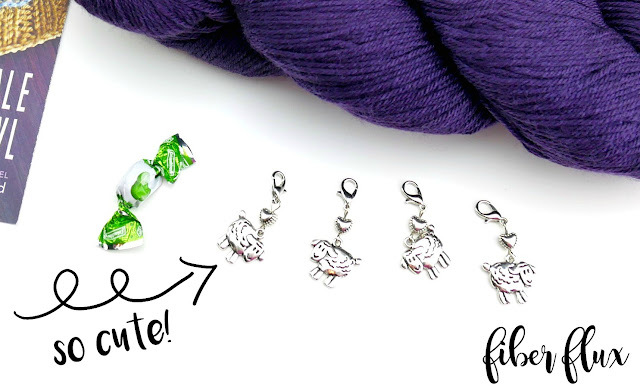 Here is the treat for March...super cute sheep stitch markers...awesome! Close up of the yarn this month...fabulous! How neat is that? In addition there are promotional codes and you can earn points with every crate that you can collect to buy things in their online store too. Learn more about KnitCrate here! Each month there is something different, a fun and totally awesome way to treat yourself or a yarny person in your life. 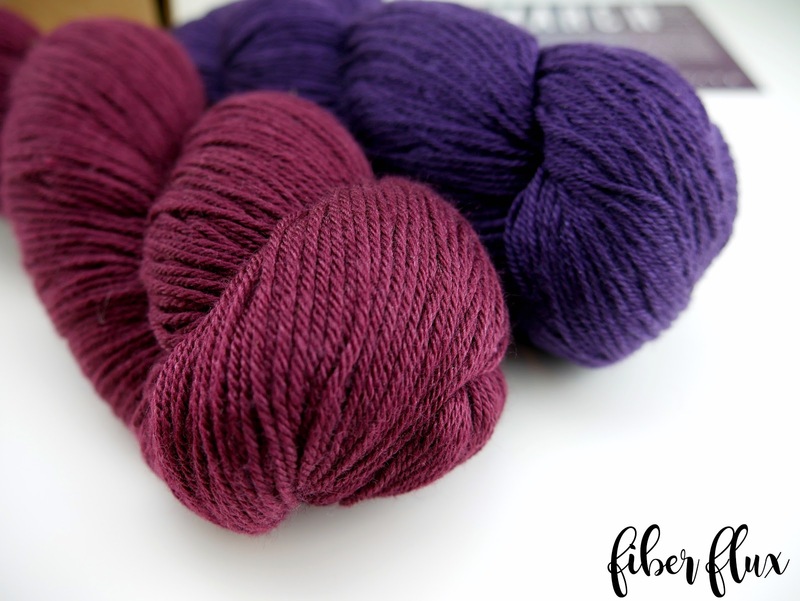 KnitCrate has generously offered Fiber Flux readers a special discount...save 20% off your first order using the code FLUX20 (just enter it at time of purchase on their site). We're also giving away a KnitCrate to a lucky Fiber Flux reader too! Awesome!! One winner will receive one KnitCrate. No purchase necessary to enter. Void where prohibited. Open worldwide to entrants 18 and over. Giveaway ends March 27th. Enter to win using the Rafflecopter below (sometimes it takes a moment to load) Now go, go, go, and enter! Special thanks to KnitCrate for sponsoring this giveaway! Thanks for the giveaway! Love your patterns and I find your reviews very helpful. Those colors are just beautiful, and I like the little sheep stitch markers. Thanks for the giveaway. What fun! Beautiful yarn and what fun to get a present in the mail! Thanks for the chance to win!! Happy spring to you. Thank you so much for the giveaway. Those little sheep are adorable. I love the KnitCrate idea. Great post! I had the chance to visit new websites and found very interesting things! So excited to try obliterate if I win! Love your posts! I really enjoy seeing these unboxing reviews as I have yet to subscribe to knitcrate (hoping to receive one as a gift in the future). Thank you for all you share. 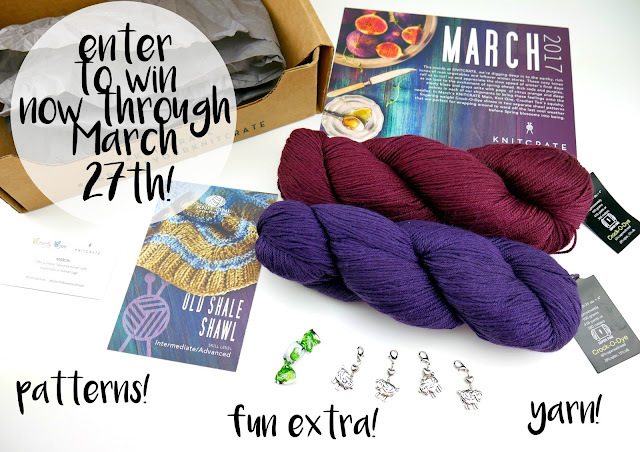 I would love to win a Knit Crate box. Thanks for the chance. This is a very nice blog. I tried to teach myself several years ago. I've never tried K1C2 before. The sock weight wool/nylon/silk blend sounds so yummy, and the colors are beautiful! KnitCrate sounds interesting and would love to try it. Fiber Flux has beautiful patterns. Thank you for this great giveaway! I am learning to knit and love it. Have a super great knitting day! I'm so excited about the amazingly beautiful yarn and the cool extras. I usually crochet, but I have always wanted to learn to knit. Wow, KnitCrate looks like a fun subscription! I saw your post last month about the two knit crate subscriptions. They look like so much fun! A knit crate sound awesome!! Would be nice to win and the yarn looks great. Thank you for the chance to win. I love your site, and have been following you for quite a while now. Keep up the good work! Thank you, I would love to win the KnitCraft box.. Thanks so much for your generous giveaway. I would love a chance to try this lovely yarn club! I think what you are doing is awesome. I love your videos and info. Good luck everybody! Those colours are beautiful! I haven't used any KnitCrate products before but would love to try! The yarn colors are so pretty. Thanks for the chance to win! I read so many wonderful things about these yarn subscription services, I would love to try one for myself! Thanks for the opportunity to win this gorgeous yarn. Thank you for this amazing giveaway!! I just learned how to knit and am loving it, I've looked at knit crate and the box looks so fun! Looks like a fun sub box!